This entry was posted on May 20, 2015 at 5:18 AM and has received 1475 views. There are currently 0 comments. Print this entry. How does the future look with VR and AR glasses? 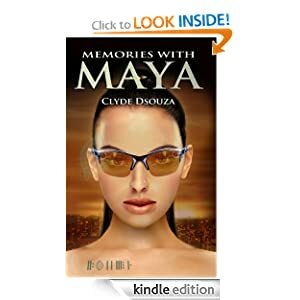 Memories with Maya is both good scifi and a relationship story with a twist. I wanted to keep reading to find out what happened next to the three main characters. I found Dan a bit irritating at first, where he doesn't express his feeling for his girlfriend Maya, but he comes through in the last third of the book. Also worth taking a look at is some of the science behind the story. The author posts this at at http://www.dirrogate.com (but if you don't like spoilers, visit the site after reading the book!) and he has also written on the transhumanist aspects of VR. This entry was posted on June 16, 2013 at 12:10 PM and has received 1684 views. There are currently 0 comments. Print this entry.